US President Donald Trump's maiden meeting with Prime Minister Narendra Modi was a "tremendous success" and took the Indo-US relationship to the next level, top American experts have said. "I thought the visit was tremendous success. I was really happy that the overall theme was one of cooperation and not confrontation," Robert Blake, the former Assistant Secretary of State for South and Central Asia, said. Blake, now a senior director at the McLarty Associates, said that many of the experts were concerned that there would be a focus on the trade deficit and device of issues like the H-1B. "Instead, I was so happy that the two leaders emphasised strategic cooperation on counter terrorism, on defence, on moving forward in a fair and reciprocal way on trade," he told PTI. "I think it sets a very, very positive baseline for the future. I don't think the meetings could have gone better," Blake said. Rick Rossow, from the Center for Strategic and International Studies, a top American think-tank, said, it was quite evident that President Trump's policy team won out over his political team in setting the substance of the meeting. "While there was a section on trade that could foreshadow a rocky period of economic ties, overall the leaders hit the right points on our recent and future progress on Asian security," he said. "The section on Pakistan-based terror groups is particularly striking, and the note of increased coordination in the Middle East holds great promise. The table is set for cabinet-level talks as we start our multitude of formal dialogues in the months ahead," Rossow said. Sadanand Dhume, resident fellow at the American Enterprise Institute, said Prime Minister Modi once again showed that foreign policy is one of his greatest strengths. "In a period of global flux, it was important for New Delhi to ensure that US-India relations remained on track. Modi achieved this task admirably with a combination of energy, charisma and charm," Dhume said. "I think from where we started this was a victory of sorts. We of course, ended the trip without any incident," noted Bharat Gopalaswamy of the Atlantic Council. "Moreover, we ended on positives on counter terrorism, especially Pakistan and also the way that we concur our views on China and Indo-Pacific construct overall. The defence relationship has been strengthened with the sale of drones. Trade was always and will continue to be sticky and have its challenges," he said. Gopalaswamy said the relationship in the last 20 years have come a long way and it has matured into a relationship that is relatively insulated to changes at the highest levels. "Of course, this is not devoid of challenges but administrations in the US and India have consciously have worked hard to build on consolidating the foundations of this relationship," he said. 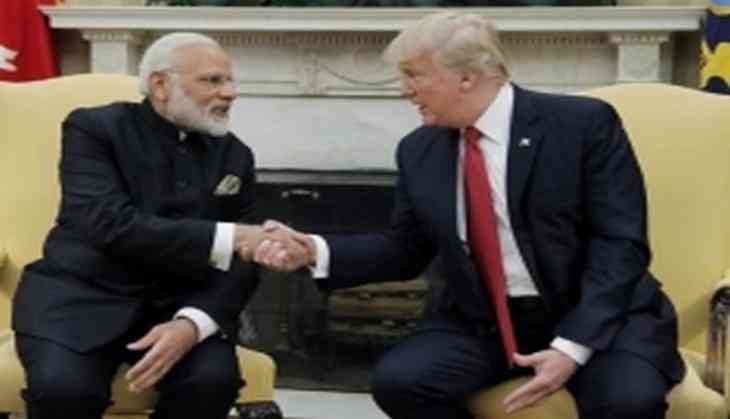 Persis Khambatta, managing director for South Asia at business consultancy Bower Group Asia, said that the first in-person meeting between Modi and Trump was very successful, given that the priority was to set a positive tone for bilateral relations and between the two leaders directly. "The visit and meetings mark a strong beginning with the Trump administration, principally in areas of strategic convergence including the Indian Ocean Region, counter- terrorism and security cooperation," she said. "Overall, steps were taken to set US-India strategic and security relations on a steady and growing course in coming years, a signal that won't be lost on Pakistan, North Korea and China, all alluded to or mentioned by name during the visit," she said. Commercial issues were not emphasised as much as they have been in the past, and thorny issues were avoided, though overall bilateral trade continues to grow steadily, Khambatta said, adding that both countries have more work to do to eliminate hurdles to deeper investments going both ways. Importantly, both leaders pointed to their efforts to slash red tape and enact tax and regulatory reforms in order to court investments in their respective countries, Khambatta said. "Trump's emphasis on a 'fair and reciprocal' trade relationship and his desire to lower the trade deficit with India were expected," she said.